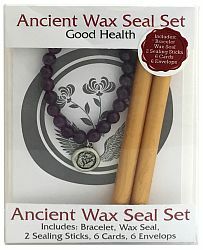 Throughout history Wax Seals have been used to seal letters and important documents and have become valuable works of art since the earliest civilizations. This time-honored tradition has been used by kings, royalty, political leaders, artist and more and have sealed some of the most special love letters and most important documents of history. To continue this nostalgic tradition, using the special symbols, we have created these wax seal charms that can also be used as a real wax seal.